I've had a taste for all things post-apocalyptic ever since I read Raymond Briggs' relentlessly bleak and utterly British graphic novel, When The Wind Blows. 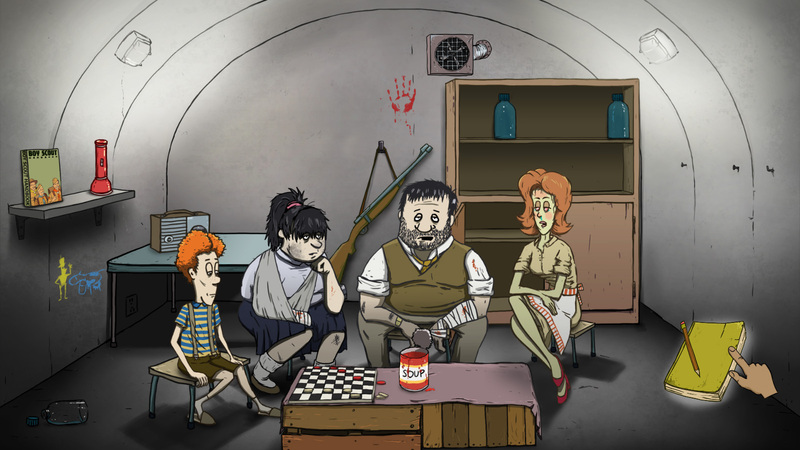 So my interest was immediately piqued when I stumbled across 60 Seconds - a survival sim that, like Briggs' book, deals with one family's effort to live through a nuclear holocaust. 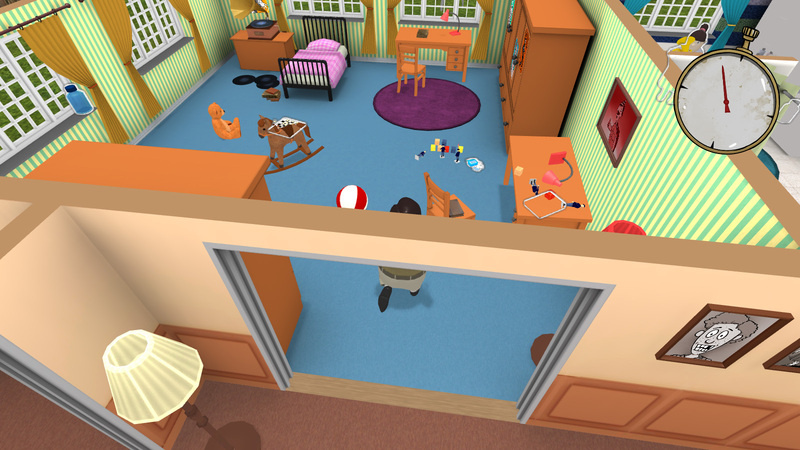 The game begins with you, as the father in a family of four, standing in the hallway of your house. Mere moments later, a nuclear warning siren blares, giving you sixty seconds to grab all the supplies you can and clamber down to your subterranean shelter. Once you do head underground the game switches from the top-down 3D view to a hand-drawn though largely static 2D aesthetic, a transition which wasn't as jarring as I suspected it would be. 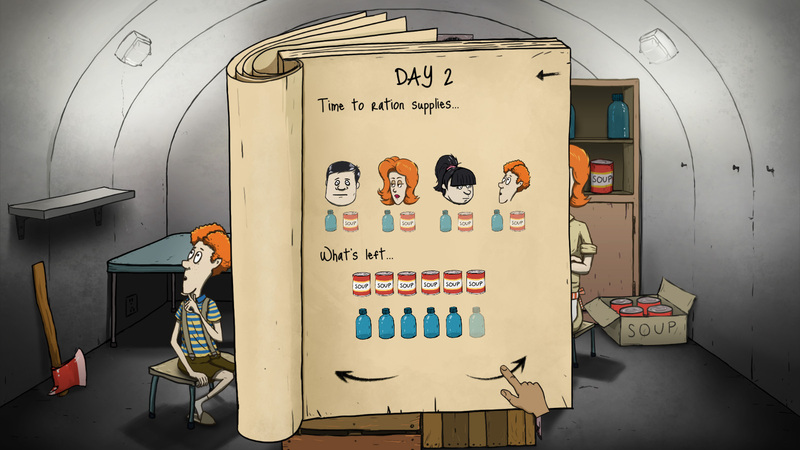 While food and water are a priority at this point, there are plenty of non-comestible objects to be collected, which may or may not assist your survival efforts. The tension was palpable as I scrambled around the house, mentally ticking off items and desperately attempting to work out whether it was worth taking the radio or whether I'd be better off leaving it and instead loading up on more water. So distracted was I by this quandary that I nearly forgot to round up my family, who had remained oddly oblivious to the warning sirens. Luckily, I was able to gather them together in time and escape to the subterranean shelter mere moments before the bomb dropped. I can't say I would have missed them since 60 Second's characters – whose identities remain the same between playthroughs - are fairly unremarkable, resembling a typical nuclear family. Instead, I was motivated by the challenge of keeping them alive for as long possible, hopefully until rescue arrived. Food? Check? Water? Check. Suspiciously sharp axe? Check..
My initial attempts at weathering the apocalypse did not go well, though it wasn't for want of trying. The first few days went well enough, the survivors sitting in strained silence as they dined upon cold beans and distilled water. And then the torture began, as the family were forced to deal with the various crisis that the game's designers chose to inflict on them. Firstly there was an infestation of radioactive cockroaches which persisted because I lacked the necessary items to dispatch this glowing menace. Then shortly after, there was a radio message urging the family to head outside to collect a supply drop – a rendezvous they were unable to attend because I hadn't grabbed a working gas mask. In the end, Ted, the family's father, died of an infection, presumably caught from the cockroaches while Dolores, the mother, went mad and left the shelter, ending the game. Nevertheless, I viewed this as a learning experience and started again, planning in advance which items of equipment I was going to take. Yet this time around, the game presented me with an entirely different set of random challenges which I was, once again, unprepared for. When I did finally manage to keep my survivors alive long enough to be rescued, a good ten or so attempts later, I had become acutely aware how little bearing my decisions had upon the game. What a cheery and only mildly irradiated lot. It's true that randomising certain aspects of a game can prevent it from becoming stale or predictable but 60 Seconds takes matters to the extreme, leaving the bulk of the game's events to chance, and suffers as a result. 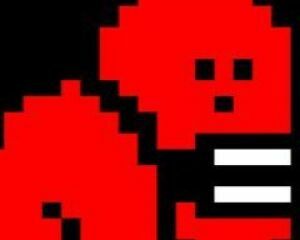 The few meaningful decisions that the game does permit you to make can be quickly undermined by the next arbitrary event. Consequently, it's near impossible to adopt any kind of strategy when playing the game. I felt so utterly unempowered that my interest in the game quickly diminished, post-apocalyptic appeal or not. Ultimately 60 Seconds' cartoony graphics and stoical approach to the end of the world do lend it a certain initial charm. However, success or failure hinges so heavily on happenstance that the game ends up becoming an exercise in frustration.